Earlier this year contacts in Devon suggested that we have a debate via letter with some members of the Occupy Movement and in particular their nearest group in Exeter. According to the format they devised we were to ask the Occupy supporters three questions and as part of their response they would put three questions to the CWO. We reproduce below the first round of that correspondence (there has yet been no second exchange) but have been asked to stress that the responses from Adam are not necessarily those of the Occupy Movement). Our assessment of the Occupy Movement can be found in “The Occupy Movement – Just Another Diversion” in Revolutionary Perspectives 60 or on our website at leftcom.org. We welcome further correspondence and discussion on this or any other issue either in the pages of RP or on our forum. 1. How do you see the global capitalist crisis? What are its causes and is there any solution? I would say that the current global crisis is simply the most recent, and the most destructive yet, of the crises that are endemic to capitalism itself. Capitalism depends upon these periodic collapses and the destruction of wealth – so-called ‘creative destruction’ – in order to function and continue to revolutionize the means of production. In this particular crisis, the unprecedented growth of the financial sector, its almost complete lack of proper regulation and its accumulation of vast amounts of unsecured wealth based on investment bankers’ gambling on the movements of the markets were the main factors that have lead to the ongoing economic downturn, in which the 99% are being forced to pay for the ruthless actions of the 1%. Banks become supposedly ‘too big to fail’, get bailed out by the people whose money the bankers are gambling with, and are then allowed to carry on with business as usual, with the shadow banking sector now worth around $70 trillion – even more than it was in the lead-up to the crisis. In terms of a solution, I believe that a radical alternative to capitalism is much needed. Personally, I would favour a system of free-association along anarcho-syndicalist lines – as was successful in pre-civil war Spain in the 1930s and as is being somewhat realised in the occupation and running under the control of the workers of public workplaces such as health centres and broadcasting centres in Spain, Greece, Argentina and elsewhere. 2. How do you see social change coming about, who will carry it out and how? True, democratic change on a large scale can only be brought about by the will of the people, expressed in a mass uprising. I feel the best way for this change to be brought about is through a combination of both wildcat general strikes and continued occupations of public squares, city streets and workplaces. The example of Iceland, where popular protest forced the government from office and lead to the writing of a new constitution through the utilisation of crowd-sourcing techniques, also demonstrated the potential that the internet holds as a revolutionary tool for democracy, as did the people’s use of social media during the ongoing Arab Spring uprisings. 3. What are the immediate and long-term goals of the Occupy movement? The immediate goal of the Occupy movement is to occupy public spaces, to bring people together and to allow them to experience direct democratic action in a non-hierarchical environment. The main way this is enacted is through general assemblies, open debates that give people the chance to have their voices heard, to debate issues and put forth proposals, which are then considered by the whole group through consensus decision-making. The focus on awareness raising and free education has also lead to the creation of ‘free universities’, where talks and film showings are given for the general public. As the Occupy movement is highly decentralized, with thousands of different groups in countries across the world, their immediate concerns will of course be slightly different in each place. The focus on bottom-up change means there is by necessity no pre-set long-term agenda, as the primary change that needs to be made is one towards actual, direct democracy, whereby the people themselves can forge the best solution to the crisis we find ourselves in. As such, although each Occupy group, including Occupy Exeter, have issued many demands and put forth various solutions, and the global movement produced a May Manifesto last year in conjunction with calls for an international general strike, the immediate goal of establishing authentic democracy needs to be achieved before setting concrete long-term goals. 1. How do you envisage the revolution that will lead to communism coming about? All previous revolutions which have led to a change in the way in which human beings organise to produce in order to maintain their existence have been based on a form of property (land under feudalism or capital today) but the proletariat is that class without private property. Its links to capital are via “radical chains”. With no form of property to defend our revolution has to be a revolution not only to change property relations but abolish them. This means we have to be completely conscious of what we are trying to achieve. And working class consciousness does not arise simultaneously or everywhere at the same time. Its struggles throw up not only an immediate recognition by some workers in one place that the system is exploitative and not in the long term beneficial to humanity but also furnishes historical lessons which shape the communist programme of the future. At first this communist programme will be carried forward by minorities from one generation to the next. There will be much disagreement amongst them as long as there is no real movement of the class in opposition to global capitalism. Only once a more general movement is in operation will the minorities unite in to a world proletarian movement or party or whatever you like to call it which will then further extend the communist programme around the world. At the moment we are losing the global class war. The restructuring of capital over the last 30 years has decimated the collective strength of the traditional working class and the class is now divided as much as it was in the nineteenth century. However a communist movement is slowly re-emerging and it is on a global scale. This movement has taken on board the lessons of the failure of the revolutionary wave which followed World War One (even though some remain debated) and we now know that social democratic and Stalinist ideas are not just wrong but real barriers to the development of communism. In fact one of the biggest nightmares weighing on the workers today is the cul-de-sac of the USSR. In one way it makes it easier to demonstrate that communism has to be about smashing the state and not about using it to leverage socialism. Socialism has to be built by the direct participation of the immense majority or it will not happen at all. One factor in our favour though is the insoluble crisis of capitalism. This crisis is as you put it is only the most recent in capitalism’s history but is far deeper than just a banking crisis. It is not caused by the one per cent ripping off the other 99 but by the cyclical crisis of accumulation. Capitalism has been in THIS crisis since the early 70s when the post war boom, the greatest boom in capitalist history, came to an end. From then on it has been battling to revive accumulation without much success. Their final trick was the speculative financial operations which began at the beginning of the 1990s and ended in tears in 2007-8. What appears as a financial crisis is actually an over-accumulation of capital. Capital has to destroy masses of existing capital values in order for a new cycle of accumulation to begin again. In the twentieth century in global conditions the solution has been global wars. This is not yet on the cards for all kinds of reasons but in the last resort this is where the current crisis will end up. They have to devalue capital. In the meantime they are trying to make the working class pay for it in price rises, speed ups, productivity drives and wage cuts. Labour has to become more “flexible”, cheaper and more insecure. The drive to reduce wages begins with a drive to reduce welfare. At the moment they are getting away with this but increasingly the attacks will drive workers to seek a political solution. They will be forced to forge a international political instrument expressing more than anti-capitalism – they will have to adopt a new programme along the original lines of the communist ideas of Marx before they were distorted by social democracy, Stalinism and Trotskyism. This political instrument will not have as its goal the conquest of state power but the destruction of all states. It will not be a government in waiting but a force inside the wider class movement guiding it to the onslaught on the capitalist system and its state. Class wide forms of organisation will be adopted based not on representation but on direct democracy (as in the original soviets or workers’ councils) with recallable delegates taking mandates from one level to the next. We note you favour the anarchist agrarian collectives in Spain (these occurred mainly AFTER the Civil War broke out and unfortunately, as many anarchists, will agree were not quite the organisations many hoped they would be – poor collectives remained poor, rich collectives remained rich and the collectives did not abolish the state so were always at its mercy. However some of their collectivist principles (as well as those of other proletarian experiences) will be adopted in any new society. We cannot be certain about all the innovations a future revolution might throw up but on the basis of past experience we know that there will be no ruling political caste or class. Revolution will come about only through the paralysis of the system of production by a mass strike (which is slightly different from a general strike in that it will not be called or called off at the whim of some trade union executive). Mass strikes are coordinated from the bottom up and lead to the formation of assemblies, strike committees etc (i.e. the embryonic forms of a new way of organising society). The spread of such bodies of course leads to confrontation with the state and that is in the last resort the organised violence of the ruling propertied classes. This leads to your next question. 2. What is your opinion on the usefulness or otherwise of non-violent direct action? Non-violent (or even violent) direct action can take many forms but in our view its greatest usefulness is in raising the awareness of a wider mass of people of the issues facing us. All the Anti-capitalist, indignados and Occupy movements have done one useful thing in this respect. At a time when many see no real alternative to capitalism they have altered the terms of the debate. Talking of anti-capitalism is widespread now and no longer the marginal agitation of a few revolutionary marxists. I’ll return to this below in Q3 but would like to deal with the question of violence and revolution. Direct action by small minorities may have propaganda value but it is not the route to system change. Only a wider rising of the working class can achieve this. The more coherent, conscious, united and organised that movement is the less violence there will be in the revolutionary process. The propertied classes have never given up an item of property without a fight and they will do everything in their power to break class unity and when that fails they will try to turn to open repression. The violence they will unleash will a thousand times more vicious than anything the working class does (c.f. the Paris Commune – killed by the Communards – 84, killed by the Versaillaises – 20,000 plus). The better prepared we are the more likely we are to be able to snuff out their violence quickly and get some of the forces of bourgeois order to turn their guns at their masters. Experience again suggests that this won’t happen until the masses are moving in great numbers around a coherent aim. 3. Do you not agree that our society is more complexly-stratified (i.e. the existence of a 'managerial class' mediating between the bourgeoisie and the proletariat) than Marx described it? 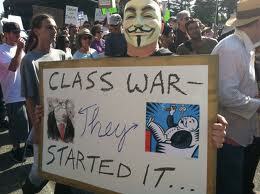 Is not opposing 'the 99%' and 'the 1%' a view of society more conducive of revolutionary action? Absolutely not! The social structure is no more varied today than it was in Marx’s time (even if the categories are different (e.g. we have a “service industry” when before the First World War we had over a million domestic servants in the UK). All the sociological surveys concocted to complicate the picture are designed to create confusion over this (a confusion which did not seem to exist in the various responses to the death of Thatcher – everyone knew on which side of the class barrier they stood then!). It seems very clever and overwhelmingly a great idea to talk of the 99% versus the 1% but this is not only wrong but dangerous. The 99% also includes the petty bourgeoisie the police and a whole range of enemies of the working class. They don’t want what we want (the end of capitalism). They just want a “fairer” capitalism. This in itself is an oxymoron. In this respect the “occupy” movement is the child of the “no-globals” of the Naomi Klein, ATTAC schools of thought. They are not against capitalism but just BIG CAPITALISM. You can make common cause with libertarian American businessmen on that programme. And let us be clear it is only the wage workers who do the work who have the real power to paralyse the system and form the basis of a new society. They alone have the capacity to be “revolutionary”. Sure, they will accept the cooperation of other classes if offered but there is no question of who will be leading the process and on what programme. When you talk of democracy what do you mean? Do you mean the existing process of representation (which we think is a useful cover for the dictatorship of the capitalist class) or are you simply using the term to imply a real participatory system in which the vast majority will be permanently engaged as part of daily life? We think only the working class can bring about such a “democracy” and it showed in the Paris Commune and the Russian Revolutions of 1905 and 1917 that it has the capacity to establish such a living entity in contrast to a capitalist system which only demands a cross on a ballot every 5 years or so to endorse who will claim to represent you in the capitalist parliament. I don’t know whether the terms of our discussion demand we ask 3 more questions or whether you just respond to my responses (in which we tried to take on board some of what you said in your replies) but this is our first offering.